We have recently treated a termite protection to a house in Bulleen by installing the Reticulation System. Reticulation is a system designed to distribute termiticides around the base of buildings to form a termite barrier in accordance with Australian Standard AS 3660.1-2014 (for more details see the Termites Protection for New Buildings). Term Stop is the Reticulation system we offer to our customers. With the changes in the Australian Standards the reticulation System is an acceptable Part A and Part B treatment to Subfloor and slab. Attached photos showing 6 Units Project in Doncaster East in Melbourne and how we installed the reticulation system in the garden area. Some slabs are concreted in 2 stages. Some termite protection specialists sometimes either ignore or forget about how important and high-risk area for termite infestation it can be. Construction Joint can be treated with a physical barrier as seen in the photo and before any timber framing is installed. Best Termites Control provides pre-construction physical or chemical termites protection solutions in Melbourne. The following images shows the termite protection service provided by Best Termites Control in Melbourne by using Home Guard Blue Sheets. Home Guard Blue sheets solution is a perfect subfloor termite protection barrier system complies with the Australian Standards 3660.1. Part B Termites Chemical Barrier is a very important stage of a complete termite treatment to any new building. The most suitable time to apply the termite chemical barrier solution is after construction is completed fully and cleaned up, cutting or/and filling are all done and before concreting/paving or gardening to the perimeter of the building. The following photos show the HomeGuard blue sheets installed to subfloor walls and stumps for termite protection before installing barrels and joists in a new house construction project in Melbourne. In the case when a Builder missed calling us on time before concreting, we have a very professional and acceptable HomeGuard solution for termite protection. By chiseling around every penetrations and applying silicon like material name (Termiflex) produced by HomeGuard physical termite barrier manufacturer to solve this issue of termite protection. This photo shows the end result and how the Termiflex temite solution seals the gapes around the pipe and closing any chance of entry point termites may have. 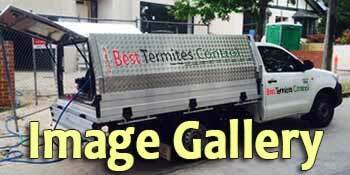 Termite infestation control and treatment by Best Termites Control in a home in Melbourne.